As shown in the table below, an average of 18.9 million tonnes of wild-caught fish are used each year to make fishmeal and fish oil, based on data for the period 2005-9. Most of this fishmeal and fish oil is fed to farmed animals, mostly farmed fish and crustaceans. Table to show wild fish tonnages used for reduction, and fishery production for other non-food uses, as reported by the FAO. Source: FAO yearbook. Fishery and Aquaculture Statistics. 2009. * Includes use of aquatic products for feed and bait, for ornamental purposes, withdrawals from markets and any other non-food use of fish production (e.g. fertilizers, medical uses). The extent to which this includes aquaculture production and non fish species is not clear. The numbers of fish represented by this tonnage is more difficult to estimate because the species composition is not published, and a more cautious estimate has been made at between 450 and 1,000 billion individuals (see numbers of fish caught for fishmeal). This estimate is based on the numbers of fish caught for species that are reportedly mainly used for reduction, and corresponds to an overall mean weight of 18-41g for these “industrial” species. A study by Tacon and Metian1 estimated that respectively 88.5% and 68.2% of global fish oil and fishmeal production were fed to farmed fish and crustaceans in 2006, of which respectively 76% and 47% of global fish oil and fishmeal production were fed to farmed fish. If the proportions by numbers are similar to the proportions by meal/oil tonnage, this suggests that respectively 400-910 and 310-700 billion feed fish are used to make fish oil and fishmeal for aquaculture each year. Of these, respectively 340-780 and 210-480 billion feed fish are used to make the fish oil and fishmeal fed to farmed fish. This huge number of animals die without any method of humane slaughter. In addition, feed fish are often fed directly to farmed fish and crustaceans, either being fed alone or processed into farm-made feeds. The FAO reports that a further 4.75 million tonnes (see table above) of wild-caught fish are used for feed, bait and other non food purposes on average each year. A higher figure is given by Tacon and Metian2 who estimate, based on a range of data sources, that between 5.6 and 8.8 million (for which the mean is 7.2 million) tonnes of wild feed fish were used in aquaculture as direct feed, or for farm-made feed, in 2006 (mostly in Asia). These species include small pelagic fish as well as other fish of low commercial value, sometimes termed “trash” fish (a perjorative term by people who presumably place no value on sentient wildlife), and juveniles of commercially important species. If Tacon and Metian’s figures are correct, and if it is assumed that the average weight of all these feed fish is similar to that of the key industrial species, estimated at 18-41g (see above para), then we estimate the numbers for these additional feed fish to be between 140 and 490 billion. Combining the estimated 310-700 billion feed fish (from above) used for fishmeal consumed in aquaculture (which are also used for fish oil) with the estimated 140-490 billion fish fed directly to farmed fish and crustaceans gives a total range of 440-1,200 billion wild fish used entirely as aquaculture feeds. Many of the species caught for feed are also eaten by people and using them for feed is therefore wasteful of scarce resources. Some feed fish species, such as blue whiting are being fished beyond sustainable limits for the species and the wider ecosystem impacts of removing large numbers of these feed fish from the marine food web are uncertain. Left in the sea, small fish of non-food species would have provided ecosystem services, forming part of the diet of other commercial fish as well as of marine birds and mammals. From an animal welfare perspective, catching fish to feed to farmed fish multiplies the welfare impact of fish farming many times over, since each of these many feed fish is likely to have suffered a slow and distressing death from suffocation in air or being buried alive under a mass of other fish. 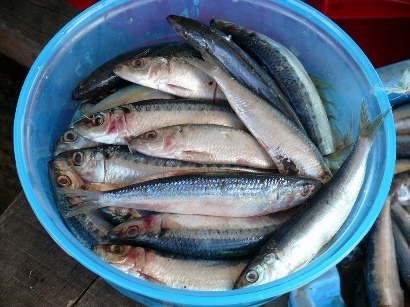 As discussed in use of fish oil and fishmeal as feed, most of the world’s fish oil production used in aquaculture, and much of the fishmeal used there, is fed to intensively farmed carnivourous fish speices which together comprise just a small proportion of total farmed fish and crustacean production.